The final upgrade to the Falcon 9 rocket — the so-called Block 5 version — will be capable of being used 10 times, with minimal refurbishment, the company says. The tweaked rocket will debut in a Friday afternoon launch. SpaceX has long touted reusability as the key to reducing launch costs, and eventually, making its way to the Red Planet. But so far, it has relaunched 11 of its workhorse Falcon 9 rockets, one time each. And it has taken at least several weeks to turn those around for the next launch. On Friday afternoon, the Hawthorne space company will debut the latest and final upgrade to the Falcon 9 — the so-called Block 5 version — which the company says will be capable of being used 10 times, with minimal refurbishment. Next year, the company plans to relaunch a Block 5 rocket within 24 hours, said company Chief Executive Elon Musk. Some of those changes include adjustments to manufacturing practices. For example, the rocket’s metal engine support structure, known as the Octaweb, will now have a bolted design, rather than a welded one. That makes it easier and faster to produce, according to a Reddit question and answer session hosted by Andy Lambert, SpaceX’s vice president of production. The Block 5 version of the rocket also includes upgraded electronics and guidance systems, and new and additional thermal-protection technology to protect against fires in the engine and on the booster’s landing legs, Musk said. Those legs now also have a latch mechanism to allow for easy and repeated opening and closing. In the past, stowing the landing gear took several hours, he said. The rocket’s grid fins, which help steer the first-stage back to Earth for landing, are now all made of titanium — a change from the company’s use of aluminum, which Musk said “got cooked pretty hard” in the past. The titanium grid fins require no refurbishment work between flights, he said. The upgraded Falcon 9 represents that rocket’s final iteration, said Bill Ostrove, aerospace and defense analyst at Forecast International. SpaceX intends to eventually phase out the Falcon 9 and the larger Falcon Heavy in favor of its next-generation rocket and spaceship system known as BFR, which will be developed at the Port of Los Angeles. BFR is key to SpaceX’s plans to colonize Mars and will be launched from the company’s south Texas launch site, Musk said Thursday. Musk estimated that the Block 5 version of the rocket will fly about 300 times before the line is retired. SpaceX President Gwynne Shotwell told Space News in November that upgrades in the Block 5 version of Falcon 9 were driven largely by requests from NASA and the U.S. military, which will rely on the rocket to transport astronauts to the International Space Station and launch national security satellites, respectively. The new version has greater lift capacity and its manufacturing process has been simplified, she said. On the Thursday call with reporters, Musk said both the efficiency and thrust of the rocket engine have increased. The company has also upped the fault tolerance of many of the rocket’s components in line with the higher safety standards of crewed spacecraft. The Block 5 upgrade also should decrease turnaround time between launches, which is key to lowering costs. SpaceX advertises Falcon 9 launches as starting at $62 million. 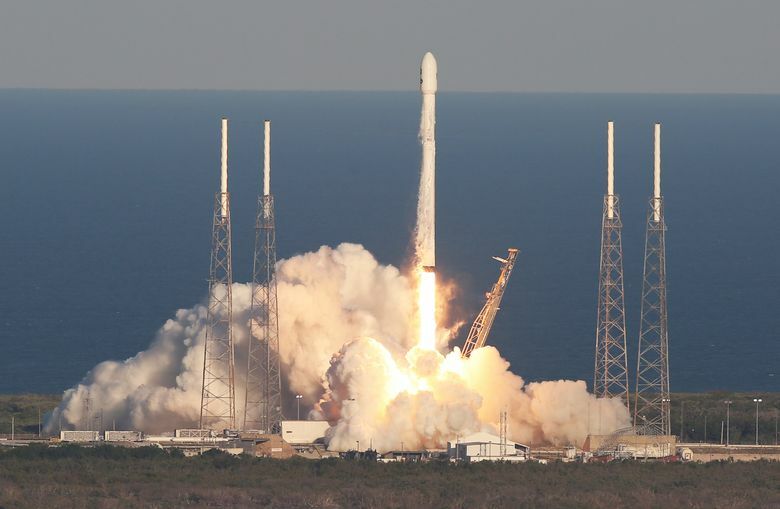 Musk said Thursday that a launch on a reused Falcon 9 rocket is now about $50 million. In the long-term, he said the marginal cost of a Falcon 9 launch could be as low as $5 million to $6 million. But, he cautioned that the company still has fixed costs. It would need to recover the development costs associated with the reusable rockets and needs to pay for development of BFR and its Starlink satellite constellation. Decreased turnaround time is important for SpaceX’s future plans, including launches of its much larger Falcon Heavy rocket — which utilized two reused Falcon 9 first-stages in its maiden launch in February — and development of BFR. Block 5 is intended to reach 10 or more re-flights without scheduled maintenance — in essence, by simply moving the rocket from its landing spot, refueling it and then putting it back out on the launchpad. “That’s really going to help them in their operations, reducing manufacturing costs,” Ostrove said. This first Block 5 rocket, however, will go through “rigorous” testing and analysis and will not be re-flown for a couple of months, Musk said. He said he expected “substantial re-flight” of Block 5 rockets later this year, with some boosters flying three or four times.